Selected by the Dallas Cowboys in the 2017 NFL Draft in the second round and 60th overall pick, Chidobe Awuzie began to turn heads in his sophomore season in 2018 when he was perceived to have a big chance of becoming the most dominant cornerbacks that the Dallas Cowboys have had in years. Injuries marred his rookie season seeing him play just 10 games, however, at the second time of asking, Chidobe’s career couldn’t look more promising. Let’s take you on a journey of his life and career so far. Biography – Who Is Chidobe Awuzie? As his name has already given away, Chidobe Awuzie has Nigerian roots. He was born on May 24, 1995, to Nigerian parents who immigrated to the states to chase the American dream and fortunately, they are now living it in San Jose, California where Chidobe was born. Chidobe is the youngest of three children. His first name Chidobe means “God will guide me,” while his surname Awuzie, could be described as someone who has gone through a lot and has finally achieved success. Chidobe’s parents were born in Lagos, Nigeria but immigrated to the United States to get a better education. His mom Victoria Awuzie graduated from Philander Smith College in Arkansas while his dad, Goerge Awuzie earned his degree from Southeastern Oklahoma State in Durant. After graduation, they each got a job at the department of motor vehicles in San Jose, California and soon began raising kids in the Bay Area. Awuzie’s parents raised him with Nigerian principles that had helped them achieve success. Chidobe was taught by his parents the essence of taking his academic serious, thus though he fell in love with football in school, Chidobe knew better than to joke with his academics. Consequently, he graduated half a year earlier with a degree in business. 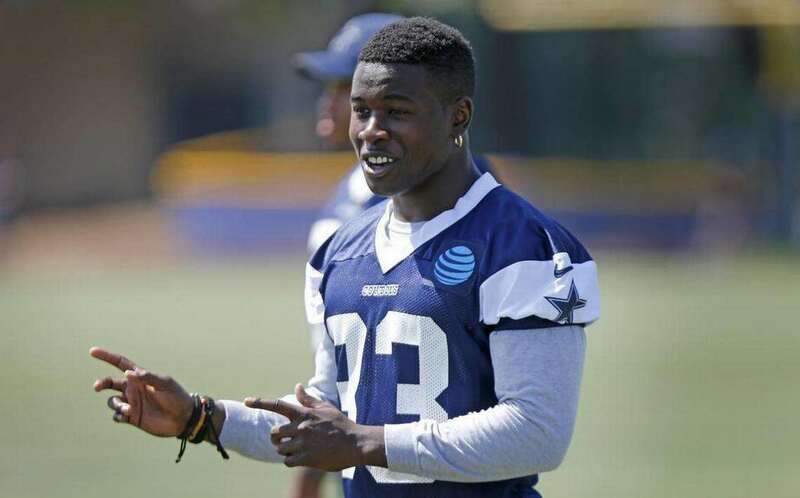 Chidobe Awuzie began his footballing career at Oak Grove High School in San Jose, California playing at the cornerback and sometimes wide receiver position. He impressed greatly in high school and was by ESPN and Rivals.com rated as a three-star recruit. Awuzie earned a lot of honors in high school where he also tried his hands at basketball and track sports including running and long jump. Awuzie indeed made his parents proud in high school, receiving scholarship offers from “Power 5 schools,” including Utah and Washington State, however, he committed to the University of Colorado Boulder. He began to impress from his freshman season, starting 7 games and appearing in a total of 12. His 645 snaps in defense became the third-highest by a freshman in the school’s history. Chidobe Awuzie recorded even more impressive stats in his junior year when he made a total of 90 tackles from 13 games. His 78 solo tackles and 4 sacks set the record for the most tackle from a defensive back in CU’s history. By the end of the year, he was named to the All-Pac-12 football team second-team. With all of these stats, Chidobe received a handful of honors as he prepared for his final college year. He got named to both the Thorpe Award and Nagurski Award watch list given to the best defensive back in the nation and the best defensive player in college football respectively. He was named to the All-Pac-12 second team, a second time in 2016. Awuzie wowed at the NFL Combine hitting a SPARQ score of 137. SPARQ is used to test a player’s athleticism. He worked out privately for a handful of NFL teams including the Tennessee Titans, Philadelphia Eagles, Oakland Raiders, and the Dallas Cowboys who would select him in the second round as their 28th pick and 60th overall pick. Prior to the draft, NFL draft experts had predicted that Awuzie would get selected in the 1st or 2nd round. ESPN rated him the 7th best cornerback while Sports Illustrated placed him at number 15. On May 11th, 2017, Chidobe Awuzie inked his first professional football contract, a four-year, $4.28 million contract that came with a signing bonus of $1.25 million. With that money, Awuzie has been able to afford a life of luxury. On his mother’s birthday in January 2017, Awuzie bought her a white Range Rover, a car she’d crave since she was a kid. The car retails upwards of $50,000. Awuzie himself rides a sleek Mercedes Benz. This bloke managed just 10 games in his rookie season however, he recorded 25 tackles, 7 pass deflections, and 1 forced fumble. Chido, as he is affectionately called by teammates, stands at exactly 6 feet tall, that is 1.83 m. He weighs 202 pounds (92 kg). His pre-draft measurables per the NFL Combine showed his Arm length at 30 5⁄8 in (0.78 m) and his hand size at 8 1⁄2 in (0.22 m).